X SPEAKS is a performance-based social practice project conceived and led by artist Nsenga Knight. In February 2015, Knight invites members of the Black Muslim community to collectively perform or present Malcolm X’s final speeches and reflect on his continuing pertinence on the 50th anniversary of his death. Everyone is invited to watch the live performances and participate in the following discussions here on YouTube and Twitter using #XSpeaks . 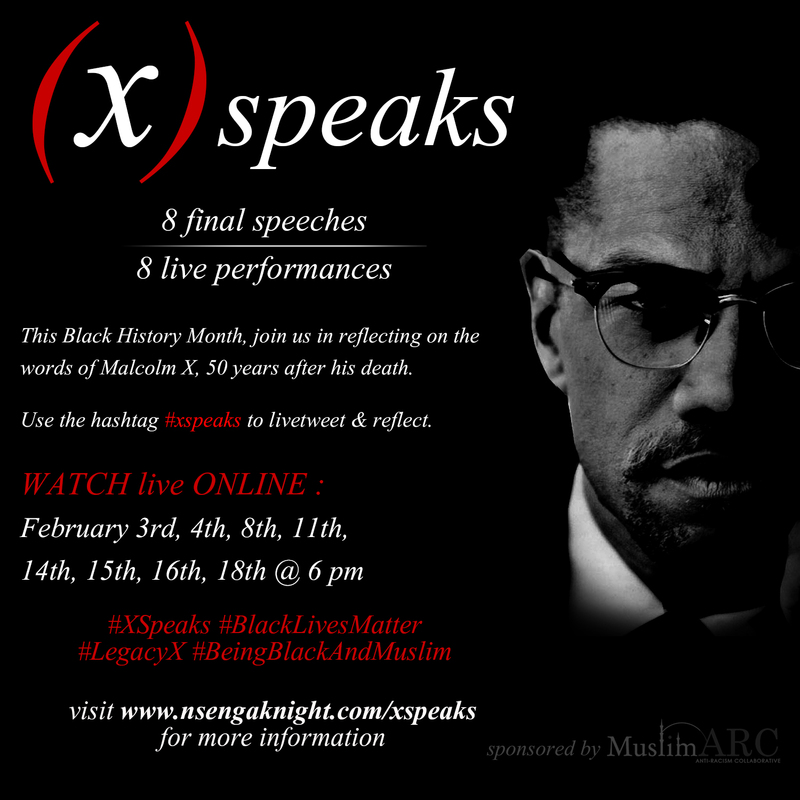 X Speaks takes place on February 3rd, 4th, 8th, 11th, 14th, 15th, 16th and 18th @6pm EST and the speech dates follow Malcolm X’s original 1965 lecture dates. Please check www.nsengaknight.com/xspeaks regularly for information and updates on this project. X is a mathematical symbol for the unknown. In the early part of the 20th century thousands of Black people began replacing their last names with an X to symbolize their identity as Muslims – Malcolm X being the most notable X in our history. The “X” in X Speaks represents Malcolm X and the X Speaks project collaborator. As X, he or she symbolizes a present or potential embodiment of Malcolm X’s legacy and an activator for his speech. As a variable, X changes each day within the X Speaks project. Knight provides the speaking material to each X Speaks collaborator. This project is sponsored in part by Muslim Anti Racism Collaborative. Malcolm X was an African-American Muslim minister and a human rights activist. In 1964, a year before his assassination, he went on a religious pilgrimage to Mecca and was forever changed, on February 15th 1965 stating, “While I was in Mecca among the Muslims, I had a chance to meditate and think and see things with a great deal of clarity — with much greater clarity than I’ve achieved from over here…” He had renounced the anti-white views that he preached as a minister in the Nation of Islam, stating in a February 14th 1965 speech given in Detroit, “The real religion of Islam doesn’t teach anyone to judge another human being by the color of his skin.” He promoted unity amongst all people, and an increased international outlook to solve the human rights violations against Blacks in America. Because his death occurred when he was on the brink of his evolved philosophical and spiritual orientation, his later philosophy is less known. He has been called one of the greatest and most influential African Americans in history and his legacy holds a special place in the hearts and imaginations of Black Muslims for whom he stands as a model for leadership, social change, and community engagement. X Speaks collaborators embody Malcolm X’s speech by activating it through performance in a disembodied digital form – the internet; bringing him into the present imaginations of diverse audiences via smartphones, tablets, laptops and desktop computers.